I painted the two pub signs above for my grandpa's "set-up." 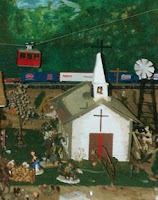 He's been working on a town diorama for the past 10 years or so. He doesn't stick to any one scale, but on the average I'd say it's about 1/32. It used to take up the entire wall of his living room. Now at 94 he lives in an assisted living home, so he only has room on his window sill. His newest addition is a scratch-built pub. My mom thought it would be a good Christmas gift for me to make signs. 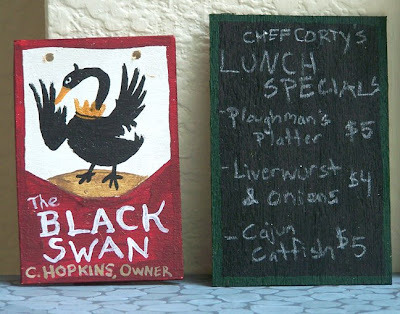 The balsa wood swan sign is 3 inches tall. I also sent little color print-outs of old Guinness posters to decorate the model pub's walls. These two small photos are from his 2002 spring/summer "set-up," as he calls it. He changed the buildings and terrain by season. 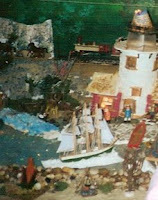 The lighthouse is a Quaker Oats container. The church has a plexiglass roof so you can see inside. I took the liberty of naming his pub the Black Swan. This is the pub in Bristol, UK where his Army unit was working during WWII. I have been interviewing him about his service during the war. 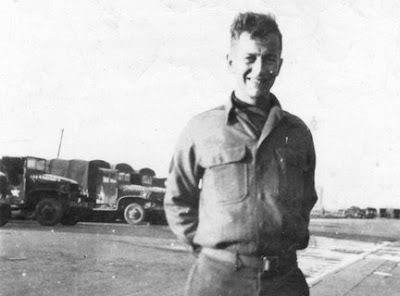 He was part of the transportation corp, moving supplies in England, Normandy and later, Antwerp. I'm amused at all the stories centering around food and drink. For instance, there were no pubs in Utah Beach, so the officers couldn't figure out how the men were all getting drink. The French family that owned the apple orchard were they were camped were giving the troops hard cavlados (apple brandy). The still was constructed of old airplane parts! 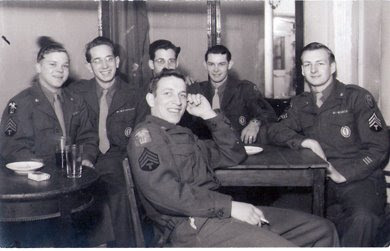 Having a drink in the photo above are men from my grandfather's unit, the 304th Port Co., 519th Port Bn. This is not the Black Swan. It's a bar in Antwerp, Belgium. This photo was provided to me by Dave Weaver (the guy 2nd from left in glasses). Here's a little scale comparison of Vendel's dwarf archers (on the left and right), and a Grenadier Fantasy Warriors dwarf (in the middle). This Grenadier archer is actually bending at the waist, so he looks shorter than his mates in this shot. He was an eBay find. Mirliton has the full Grenadier FW Dwarf range in production. Before committing to a big dwarf order from Italy I wanted to buy just one to see how Grenadier mixes with my Vendel collection. I think they mix pretty well! 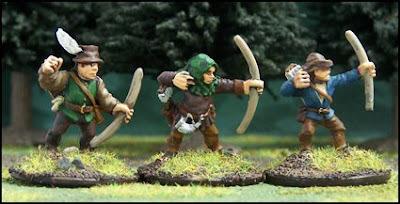 The Grenadier FW dwarfs were sculpted by Nick Lund. The Vendel Miniatures dwarves were sculpted by one of the Patten brothers, Duncan I think. More miniatures companies ought to credit their sculptors! The Vendel fantasy miniatures line is now sold by SGMM. P.S. The Grenadier dwarf's bow was a shapeless lump. I had to spend a lot of time bending and filing it into a proper bow. God Jul! You can expect posts on these projects in 2009. Song of Blades and heroes just released its Song of Arthur and Merlin supplement. Included in the rules is a section on the historic King Arthur. These skirmish-sized warbands will be made of 1/72 plastics. Hat has a nice selection of Late Romans and Saxons. I've been reading Bernard Cornwell's The Last Kingdom. It's inspired me to paint up a force of 9th century Saxons and Vikings. Emhar and Strelets have a good assortment of Saxons. Zvezda offers a brilliant box of Vikings, as well as Emhar. Hat's Gothic cavalry will make perfect mounted Saxons or Vikings. You can check out all these sets on Plastic Soldier Review. I live at the foot of the Rocky Mountains, so real-life stories of prowling bears and mountain lions have affected my hobby mind. Using Song of Blades of Heroes rules again, I'm composing a force of Boy Scouts to fend off hungry Bears, Mountain Lions, wolves, and walking plants of Poison Ivy. Marx Toys made a set of plastic 1/32 scale Boy Scouts. They are dressed in the Scouts' 1940s uniform. There is a variety of amusing poses: a Scout saluting, a kid knotting a piece of rope, a kid with a paddle, a couple Scout leaders, even a Boy Scout with a bow and arrow. I happen to have a bunch of odd 1/32 animals to ravage their campsite. 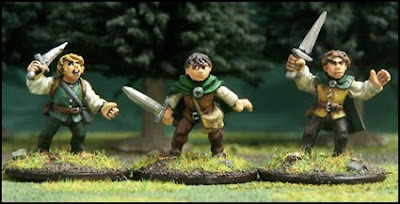 Vendel Miniatures' Hillmen will make excellent cavemen in winter dress. 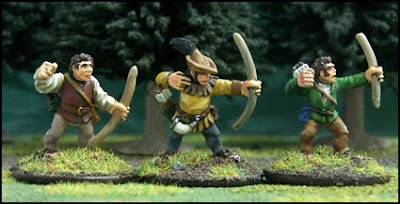 There are other 28mm cavemen sets out there, but I really wanted archers—not a common site outside of Vendel's stock. I already own several plastic mammoths. I have one saber tooth cat, and plan on ordering more. I've been meaning to play a game of WAB forever. No one close by is interested in the game, so I'm building two opposing armies for a solo game. The Celts are 1/4 done, but I haven't even started on the Romans! Warhammer Ancient Battles armies are huge, so it takes a long time to assemble your men. This is one of the reasons I have been so interested in the SBH skirmish rules—you only need a handful of models! I've been adding more and more to my collection of models representing the monsters and characters from the 1990s series of PC games. Dupré is painted and needs basing. 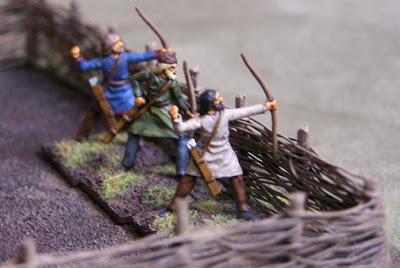 Caesar's 1/72 plastic Goblins are becoming gremlins for the wilds of Britannia. These little guys are mounted on pennies and will soon be painted. Peppered throughout the year will be photographs of Iron Age farm life vignettes: cattle, sheep, chicken fights, boar hunts, etc. I don't always have the time to work on my hobby projects, so it's been nice to see what others are doing. The past couple of months I've discovered a good number of blogs and websites on a variety of wargaming subjects. I thought it would be cool if we all completed a small project on a single theme. So! Please join me this month in creating a piece following the theme, "Snow and Ice." Your entry can be a single painted mini, a small terrain piece, or even a photo of your old models newly arranged in a winter display. It can be any genre and any scale: historic, fantasy, sci-fi, etc. See my Marx Mammoth post as an example. By the end of January 16th post a photo and write-up on your blog, photo sharing site, website, etc. Put a link to my blog in your post. 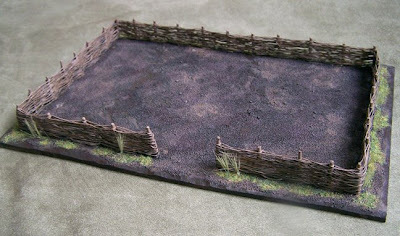 You may also include my Muster the Minis banner if you like. Email me the link, then shortly after I will crate my own post linking to all the submissions. This is not a competition, so there are no prizes. However, this little event could be a nice way to grow our hobby's online community and bring extra traffic to your website or blog. Email notice of your submission to: andrew [insert at symbol] redrampant [dot] com. I will post the roundup shortly thereafter! P.S. I have to say this isn't all my idea. My wife and a bunch of other cooking bloggers have this thing going where each month everybody cooks a dish on the same theme. I thought this kind of cooperative project would work well for my hobby too! 1) Deleting one blog does not delete all the images stored for that blog. So, you can go in, copy the html, and paste those posts into your new blog without having to re-upload all those images. 2) For some reason applying the domain name to by blog erased all the blogs in my Blog List. I don't remember how to get to some of them, so the list looks shorter than it did last week. So, if you're going to do that, make sure you have a back up to all the other blogs you follow. 3) After applying the new domain name to the blog, I noticed that the blog lists on other people's blogs stopped updating with my most recent posts. They still linked ok, but they ignored the new posts since before the name change. I think this was because the RSS reader was checking for updates to the old ferrouslands.blogspot.com site feed. The issue resolved itself after a few days. 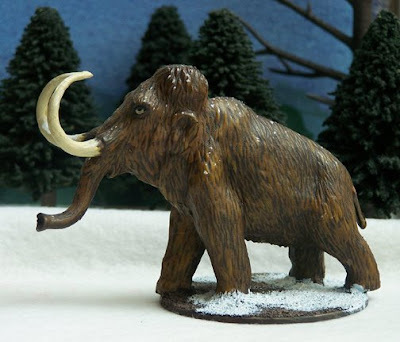 This plastic mammoth was originally part of a prehistoric playset produced by Marx Toys in the 1950s or 60s. My model is new production, recast from the original molds. Marx went out of business in '78, but a number of toy companies bought their molds and have been reissuing the toys. I bought my mammoth from the Toy Soldier HQ. Their website is atrocious—it looks like it was designed by a kid back in the early '90s—BUT they have alot of old Marx models unavailable elsewhere. The Mammoth is the perfect size for mixing with 28mm cavemen. The Marx Megatherium also works well. I love this pose, but I must say the tusks were sculpted way too high on the face. Tusks are teeth and should be coming out of the mouth! I mounted the mammoth on a 60mm plastic base. To paint the tusks I followed a GamesWorkshop tutorial on painting their LOTR Mumakil model. Interesting note: The words, "Wolly Mammoth, 23' Long" are moulded on his belly. I am now looking to buy some cavemen. I think the Vendel Miniatures Hillmen will make excellent cavemen (if I remove the shields). Copplestone Castings, Dazed Miniatures, and Jeff Valient Studios offer very nice cavemen too. 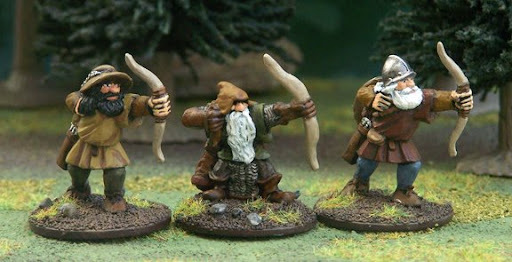 It's the archer models that draw me to Vendel. The others don't offer cavemen archers. Here are some photos of my halfling army. I have a few GW and Mithril hobbits, but these are all pictures of halflings sculpted by Mark Copplestone. The 3 on top are from the out of production Copplestone Castings 28mm fantasy range (thank goodness I got them all before he stopped making them!). I think these poses make a good Sam, Frodo and Merry. I haven't painted a Pippin yet. The rest of these models are from Mirliton. These sculpts were originally sold by the now out-of-business Grenadier. These mix really well with my Vendel models. The above pose originally held a sword. 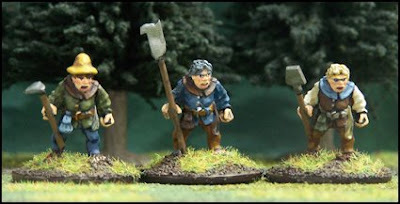 Using brass rod and green stuff I created these farm tools to represent a hobbit militia. I also modified the archer models to create a greater variety of poses. 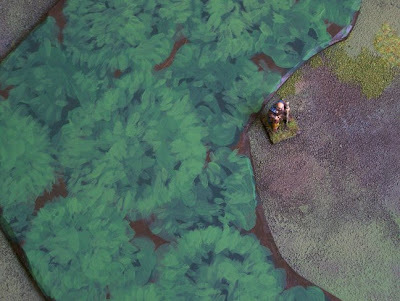 Every good miniatures game needs interesting terrain. As an alternative to simple green felt, I created these forest boards. 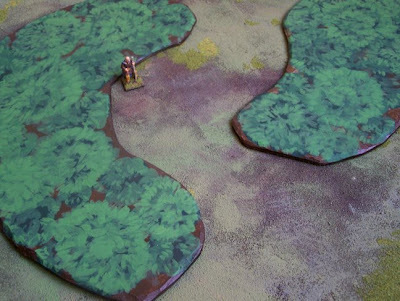 (a 28mm model is pictured for a sense of scale) These are sheets of hardboard on which I painted a bird's eye view of trees. There are no model trees present, so I can move models freely across the surface. I like how these turned out, but I am also interested in making forest boards that look more realistic. I have some Woodland Scenics model trees that can be separated from the stump. I'm going to glue the stumps to the board, and the player can pluck out the trees as he moves his models through the forest.